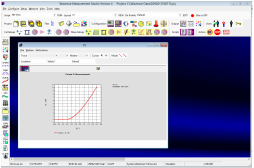 Microvue develops software and hardware for RF and microwave device characterization. Our products are used in both wired and wireless applications to characterize the semiconductors essential to products such as cell phones, wireless LANs, military radar, collision avoidance radar, and navigation systems. Wavevue Measurement Studio is an integrated measurement solution that unifies RF/microwave and DC measurements in one software application. Modules are purchased separately to enable custom configurations for each customer solution. In addition to the modules listed below, Microvue can also be contracted for custom development of new measurement modules to fit your needs.